Live, from Peoria, Illinois, it’s Saturday Night starring this week’s host, Los Cabos Cantina & Grill Downtown and featuring special guests, Patty, Esperanza, Alonso, Roberto, Brad Henz and Adam White! 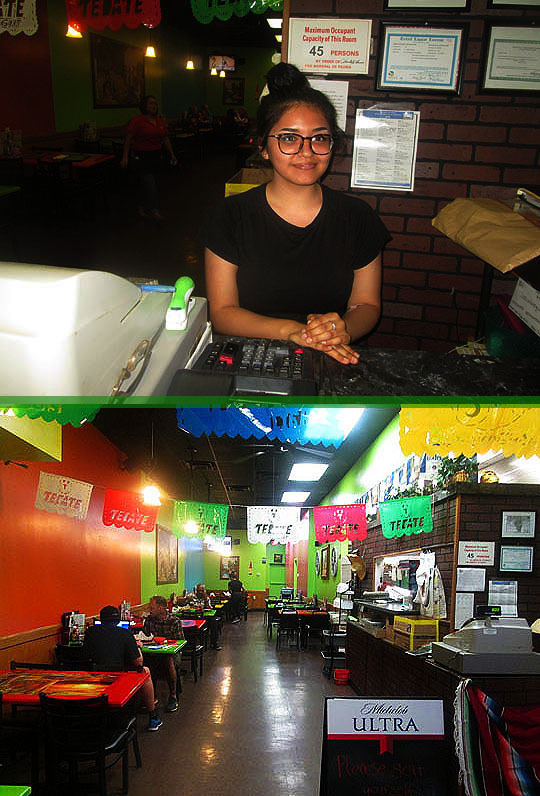 Now, please welcome, from their brand-new location on Main Street, Los Cabos Cantina & Grill Downtown! Here we are at the newest restaurant on Main Street, Los Cabos. They just opened up in April, but they do have another location in Peoria on North Sommer Street, which has been in operation about four years, so they’re no strangers to the Peoria restaurant scene. Let’s go in and start this week’s Saturday night! This place used to be a Haddad’s restaurant and I had lunch here with Steve Tarter back in 2014 and discovered that there were two murals in the front painted by my friend Chris Holbrook. Chris and I have been friends since high school and we were both into art and drawing and I’m happy that they’ve kept his murals on the walls. Patty was manning the hostess station and she told me I could sit anywhere. So I went and chose a table and sat down, I know how to follow orders! Once seated I was served some chips and salsa by Esperanza. I also got a twelve-ounce lime margarita and perused the menu. It’s quite an extensive four page menu and there’s a wide selection of choices to be had. I placed my order with Esperanza and enjoyed the chips and margarita before taking a little tour of the place armed with the MBIP Camera. Here’s a shot from the back of the colorful restaurant. There’s traditional Mexican art on the walls and on top of the tables. As you can see, there’s a nice selection of beer to choose from if you prefer cerveza over a margarita. I met David in my travels who was enjoying a taco meal. David’s originally from Memphis and told me this was his first time in the restaurant and said his meal was excellent and he’s definitely coming back. You can peek and see the guys at work in the kitchen preparing the meals though this window over here and that’s just what I did! That’s Roberto on the left and Alonso on the right. Everyone here is really friendly and welcoming, which is always nice when you’re out to eat. As I was making my way back to my table, I saw a familiar face, it’s Adam White from Running Central who’s seated on the right side of the table. We last saw Adam when I had lunch at Running Central after we tried to have lunch with the Ad Wizards at Simantel and one of the owners of Simantel pretty much told me to get out of their pristine and exclusive establishment...but I’m not bitter about that at all! Anyhoo, Adam was seated with his business partner, Brad Henz. It turns out that in addition to owning Running Central with his wife, Marie, Adam has a business with Brad called ShaZam Racing. This company specializes in timing and scoring for race events and they also can consult and help you plan a race event. You can read more about this unique company right here: ShaZam Racing. 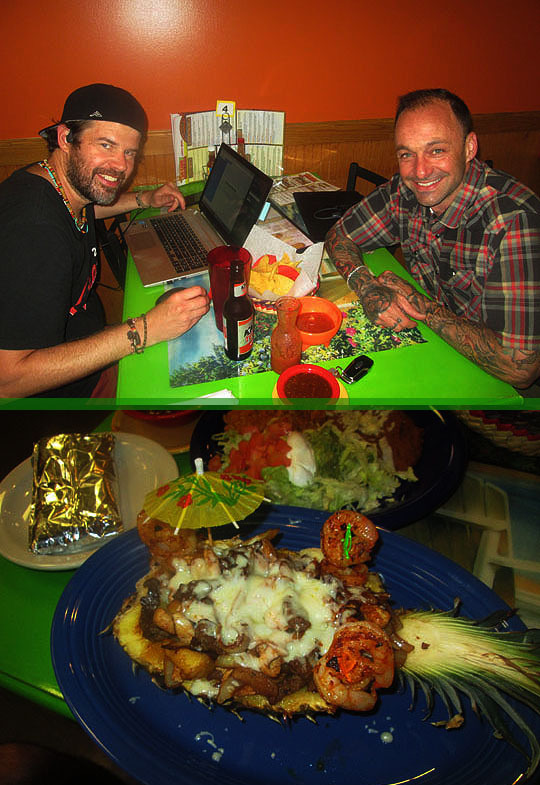 Adam ordered one of the specialty dishes that is served up in a pineapple with a little umbrella on top! I love that! 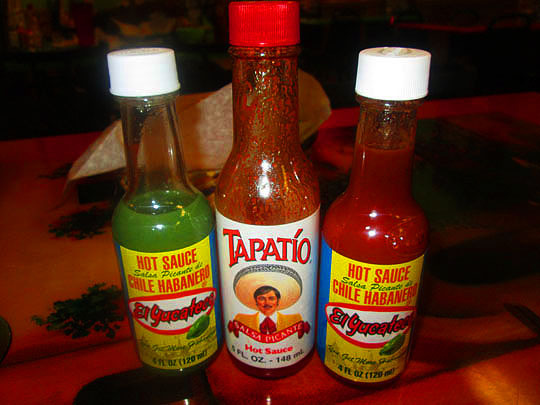 Meanwhile, back at my table, this trio of hot sauces is a sign that our Saturday night Mexican meal is just about to begin! ¡Lo cual es bueno porque estoy hambriento como Marvin! I started off with and appetizer called, Rollos de Mariscos. These are flour tortillas stuffed with sautéed lobster, crab meat and pico de gallo. The tortillas are flash-fried and the appetizer comes with a homemade Chipotle sauce to dip them in. These are so rich and tasty and I love the Chipotle sauce, it’s got a wonderful flavor with a hint of spiciness. We’re off to a wonderful start so far! They have some really unique specialty dishes on the menu and I chose one for my main course. 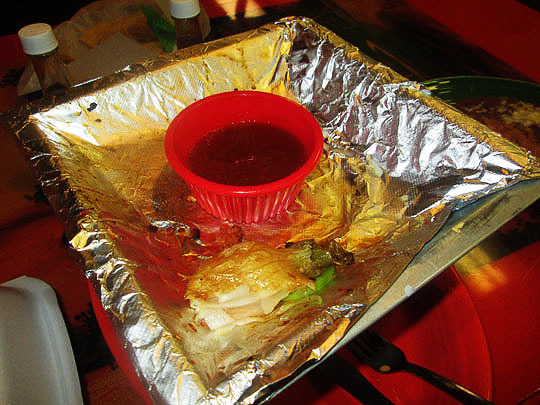 This creation is called, Parrillada and the dish is served up on a mini-grill that’s brought to your table. It’s a plentiful selection of items including, shrimp, Chorizo sausage, grilled chicken, a pork chop, grilled jalapeños, sautéed onions, slices of grilled cactus and queso fresco. You can wrap it up in fresh tortillas and make your own specialty burrito. I did both and it was such a delicious and satisfying meal! Thanks to everyone at Los Cabos for a wonderful meal and the friendly hospitality! 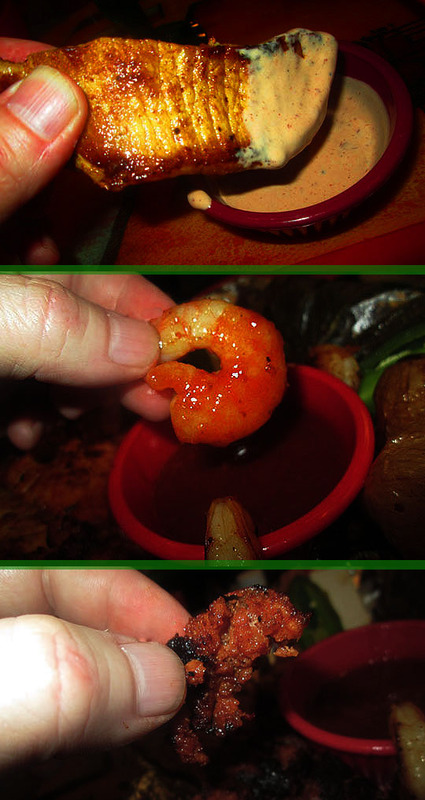 I started off with the Rollos de Mariscos appetizer and this could really be a meal unto itself! They’re four fried tortillas stuffed with fresh lobster and crab and served with a homemade Chipotle dipping sauce. They’re like Mexican seafood egg rolls and they are rich and delicious on their own, but when you dip them into the homemade Chipotle sauce they are such a tasty sensation! 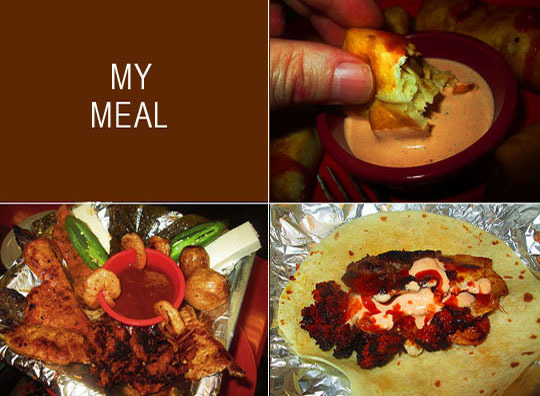 The sauce has a spicy zing to it and it balanced out the richness of the fried tortilla rolls very nicely. I chose the Parrillada from the specialty entrees and it was special indeed! The dish is served atop a mini grill and it’s like your own personal buffet of tasty grilled items. There’s shrimp, grilled chicken, Chorizo sausage, a pork chop, grilled jalapeños, sautéed onions, slices of grilled cactus and queso fresco. I sampled the items individually and then put them inside of a fresh warm tortilla and topped that off with hot sauce and the homemade Chipotle sauce for unique burrito that was a festival of flavor! Four Galloping Gourmets—There’s traditional Mexican food on the menu, but I recommend you try some of the unique specialty items that you can’t get anywhere else in town. Comida muy sabrosa de hecho! 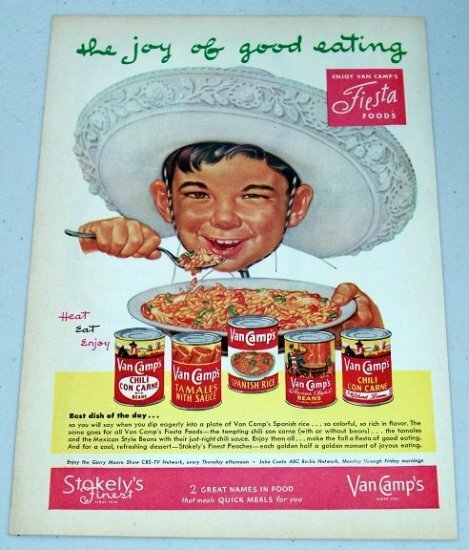 Related Posts: Saturday Night @ The Lariat Steakhouse, Lou’s Drive-In and Shogun Japanese Restaurant.